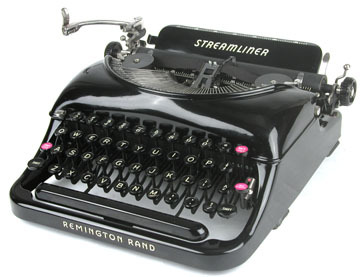 Very similar to the early specimens of the Remington 5 Streamline portable, except that the carriage return lever is full-sized and horizontal and the scale color is painted black rather than red. Its price was $49.50 at the time. The name, of course, draws attention to the streamline and Deco styling. There are two versions of the Streamliner decal: one has the word "STREAMLINER" leans forward and the other adds horizontal speed lines flowing across the word. Note: The name "Streamliner" was also used on Remington portables from the 1960s, which had plastic shell and an entirely different styling.